Welcome to Dragonhill Scottish Folds. The Scottish Fold is a very unique and popular feline. A folded ear cat named Susie was noticed at a Scotland farm in the early 1960's. 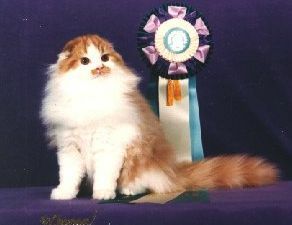 Susie became the mother of the 7th most popular breed in CFA. Almost every article found about the Scottish Fold shares this same account of history. Susie was thought to be a spontaneous mutation. However, there is an ancient Chinese tapestry that clearly depicts folded ear cats. Dragonhill welcomes our foundation felines back home.